This article is about the item from Yoshi's New Island. For other uses, see Medal. 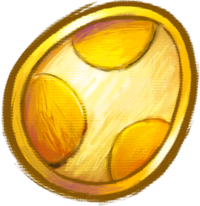 Egg Medals (Medals in the PAL version) are items found in Yoshi's New Island. Egg Medals can be received if the ball on the Goal Ring stops on a Smiley Flower. The number of Egg Medals Yoshi will get depends on the number of flowers he collected when playing the level. Five Egg Medals is the maximum for a single level run, but the player can replay the level to get the level maximum of 30. 10 Egg Medals give the player a 1-UP, 20 Egg Medals give the player a 1-UP three times, and 30 Egg Medals give the player a vehicle challenge, an extra level based on a transformation which Yoshi can complete to get extra lives. This page was last edited on December 6, 2018, at 13:30.